However, I am now having a second problem. 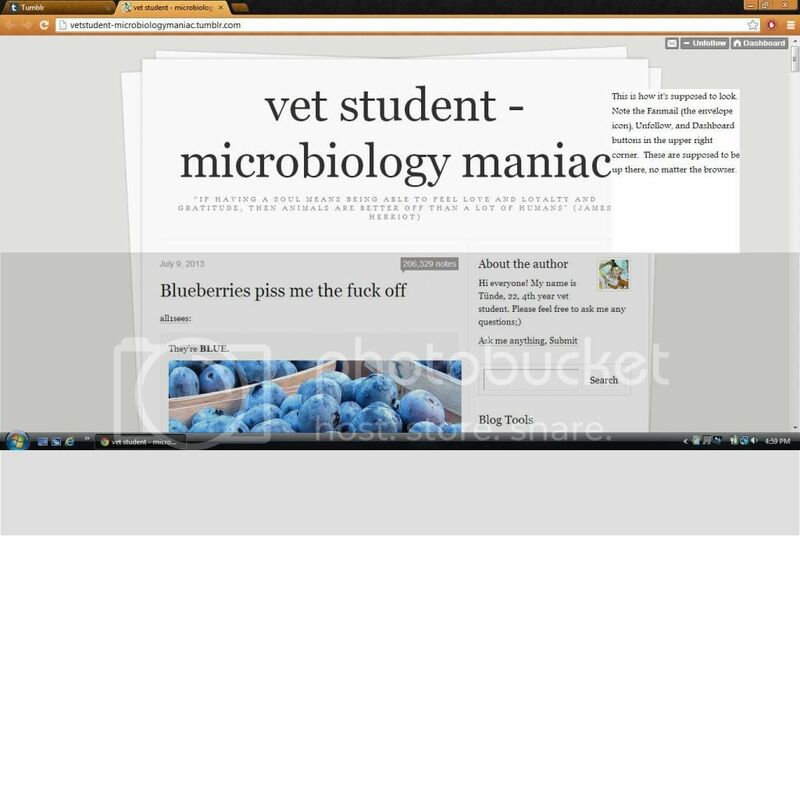 For those who are not familiar with Tumblr, when one is logged in and goes to a blog that is not their own, there are buttons that appear in either the upper or lower (depending on the theme) right corners of the page, like this: http://i905.photobucket.com/albums/ac254/unholycow/supposedtolook_zps9074a183.jpg These are supposed to show up NO MATTER WHAT BROWSER IS BEING USED. ON EVERY BLOG. Be it Firefox, Chrome (what was used here, and therefore is obviously working), Internet Explorer, whatever...they're supposed to show up. And until at least a couple of hours ago, they WERE showing up. 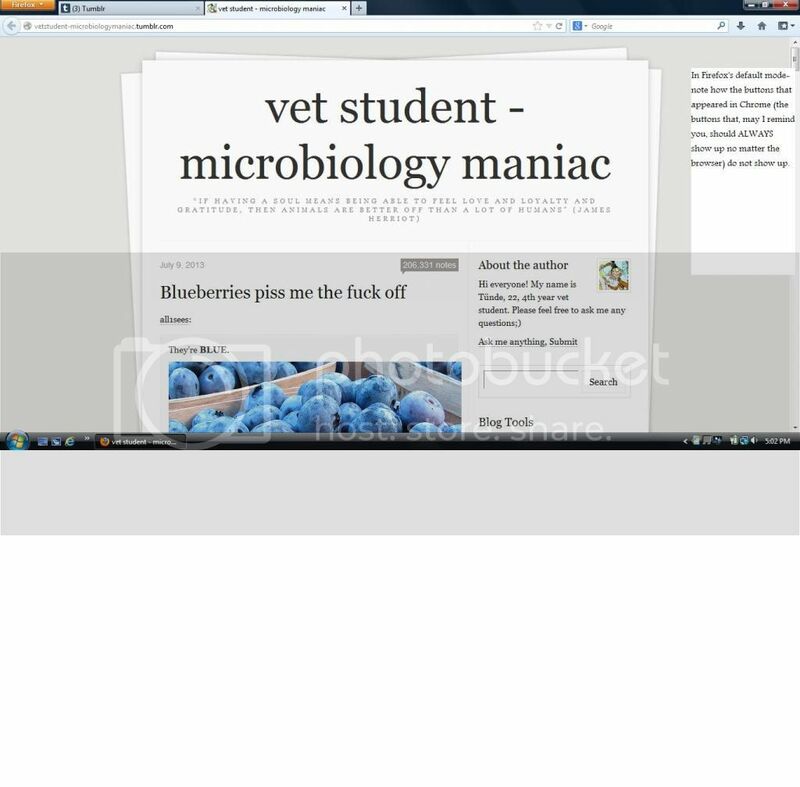 However, now when I go to pages on Firefox, they look like this: http://i905.photobucket.com/albums/ac254/unholycow/notsupposedtolook_zps1e14f35d.jpg Note that the buttons that were showing up in Chrome are missing here. I have tried reinstalling Firefox, resetting it, starting it in Safe Mode, restarting my internet connection, and restarting my computer, and none of this has solved the problem...either problem. The buttons still aren't showing up. I don't know if this is a problem on Tumblr's end, or a problem on Firefox's end, but obviously something is wrong here, and- judging by the fact that things work fine in other browsers- the problem probably isn't with my computer itself. This problem is very upsetting to me for many reasons: -First off, all of my bookmarks are stored on Firefox...which means all the blogs I go to for frequent reblogging (for those who aren't familiar with the concept- look it up, I dunno how to explain it) are saved on Firefox. Chrome's Favoriting/Bookmarking system is very unwieldy and I never quite got the hang of it...it doesn't look like Firefox's bookmark menu, and it doesn't appear to work like Firefox's bookmark menu. I have no idea how to use it. -Seeing as how all other sites are working on Firefox, except Tumblr, that means I would be going to Chrome JUST for Tumblr. And...I really, really don't like that. Because in addition to having all of my bookmarked sites here, I would be going to Chrome for one single thing. Besides the fact that I despise Chrome and IE, there's the fact that I would rather have one browser and be able to do all those things on that browser, without having to go to another one. -My Firefox is version 22...the most recent version. It has been that version for WEEKS. Weeks, and I have not had this problem until today. While I do make use of Add-ons, the fact that I started this in safe mode, and reset it as well (and as of this typing, I still am in the default mode), shows that Add-ons are not the issue here. So...can someone give me some idea as to what is going on here? When I am finished an have shut down Fire Fox, I come back to my computer and I find that Fire Fox is open, and a random URL page is open. I live alone. When I perform a single word search in the firefox address bar, such as 'asdf', 'google' 'test', i get rediredted to sitecrafting.com At first a web logo for sitecrafting shows up but my single word search is still in the address bar. Then after a second or two the sitecrafting.com address appears in the address bar and the screen refreshes to the sitecrafting.com website. However, if i do a multiple word serch in the address bar, then i get a google search as expected. For instance 'asdf asdf' give me a google search results page for that two worded phrase. I have done the keyword.url reset. I have uninstalled firefox and removed all profile/preference and then reinstalled. I have tested in safe mode with all addons disabled. None of these have fixed the problem. Please oh please help me!!!! Unresponsive scripts still, even in safe mode! Hello, I have been having the Unresponsive Script warnings for what is probably going on a year or so now, and it's getting increasingly difficult to use my computer. I'm not hugely technical with my computer, but I do know some, and have fixed many many problems before, even fixing my computer from a devestating malware virus a couple years ago myself, using only information from the internet. Which is why I find it so infuriating that I cannot find ANY answer to help me with this problem. Ps.. I have a PC, Windows XPPro, FF22.0, and I had YesScript 1.9, Personas Plus 1.7,2.1, and Status-4-Evar 2013.02.16.23 (But all have been removed with the FF Reset) and none of them were the culprit because I disabled them a while ago, and still had the problem day after day. There is a lot of discussion on https://bugzilla.mozilla.org/show_bug.cgi?id=812695 about the right workaround or how to apply it. I'm starting this forum thread to move the discussion. Switched on my system this morning and found that everything has become bigger in FF. The bookmark toolbar, the font size of websites..everything has increased in size. For example when I open up dailymail website, the site used to fit on screen in such a way that I could see the main headline completely, however now half of the screen is filled up with just the header (logo etc). I have around 20 websites that I had saved on the bookmark toolbar (with shortened names) and there was space for at least one more...but now I find that the toolbar length is unable to accommodate a couple of websites...is there anyway I can fix this? FF 22.0, Win 7. Don't know when this started but when i hover the mouse over a bookmark (in my bookmark display) it displays the incorrect name and location text. It is displaying the info for another bookmark. It does display the correct info for the bookmarks on the Bookmarks Toolbar. Is it possible to sort tags? I've tried various methods of sorting tags. None of them really represents the conventional output one would consider "sorting". I've had to, for example, prefix categories of tags in order to get some semblance of order. Lately not even this works very well after going through various updates to Firefox. Further, there doesn't seem to be anything on the Mozilla website for Firefox that addresses this question. Perhaps my library of Bookmarks is more extensive than most, and those who program the interface have never seen a need to provide this capability to sort tags. In my case, since I've used tags to introduce order and fast access to information, tags have become indispensable to that end. Maybe the reason this capability is missing is because it is not technically feasible. I would like to know whether or not it is so I don't continue to search for a solution. When playing a video on YouTube, if I don't move my mouse constantly, the video freezes. Whenever I'm trying to watch a video on YouTube, I have to keep moving the mouse constantly or else the video freezes. It happens on all videos I play and it's really annoying. I go through all the same steps; however, the favicon just does not change.